Even experienced professionals can get overwhelmed when confronted by the mass of panoramic detail found in the high mountains. Where do you start? What do you leave out – as you can’t possibly put it all in? This is especially a problem in really good visibility, when there is not a cloud in sight. As if this wasn’t enough, some of the most spectacular places are so beautifully composed that it is all done for you, and it is easy to think that all you need do is copy the composition in front of you. 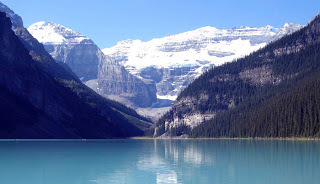 This picture-postcard view is in the Canadian Rockies where we will be going in September. Everything stands out beautifully, but in a painting you need some mystery with part of the motif just hinted at. One device for working out the best composition in front of you is a simple card rectangle with an oblong hole cut out so that you can view the scene you want. Hold it up before your eyes, closing one, and moving the card frame around until you light on the most exciting part of the scene. You may need to move it towards you, or away from you to achieve the optimum size, but this will certainly help you to isolate the scene. Where ridges pass behind a closer feature you can reduce the detail, perhaps bringing in some cloud or mist at this point, or even a snow squall. In this scene the centre of interest could well be the ‘V’ where the two dark ridges descend in the centre to the lake, but it would be a good idea to push this either to right or left a little, so that it’s not plumb centre. A hint of red or orange there might be a nice touch, and you could also use this in the reflection. The far shoreline cuts right across the picture, a common problem, but easily fixed with some foreground trees or other features. This entry was posted in David Bellamy, mountains in watercolor, Painting courses, painting holiday by David Bellamy. Bookmark the permalink.